All right, I confess: I have a dream. I bet you do, too. I bet yours, like mine, is of a far, far better world not only for yourself and your loved ones, but for everyone on this beleaguered planet of ours. And I bet you, like me, rarely talk to anyone about your dreams, even if you spend nearly all your time among politically active people working to improve the planet. Perhaps these days it feels somehow just too naïve, too unrealistic, too embarrassing. So instead, you focus your energy on the nuts and bolts of what’s wrong with the world, what has to be fixed immediately. I’m thinking that it’s time to try a different approach—to keep feeling and voicing what Martin Luther King Jr., called “the fierce urgency of now,” but balance it with a dose of another political lesson he taught us: the irresistible power of dreaming. I started reflecting on this when I returned from a long trip and found my email inbox crammed with hundreds of urgent messages from progressive groups and news sources, all sounding the alarm about the latest outrages, horrors and disgraces, punctuated by an occasional call for a new policy to right at least one of the horrendous wrongs described and denounced. Suddenly, I found myself thinking: Same old same old. The particular words keep changing, but the basic message and the music of our song of frustrated lament remain the same. We give the people the shocking facts and call them to action. And we wonder: Why don’t they listen? Then I looked at the calendar and noticed that the end of the summer would bring the fiftieth anniversary of Dr. King’s greatest speech—and I realized what was missing from virtually all those email messages: Where was the dream? Where was the debate about what the world we seek would look like? In most of them I could dimly sense that the writer might indeed have a vision of a better world. But it was always hidden somewhere between the lines, as if in the century when capitalism had “triumphed” and nowhere on Earth did there seem to be an alternative, the writer was ashamed to speak such things aloud. It wasn’t always so. I remember how incensed I used to get in the 1960s when hearing the charge from the right: “Those hippie radicals. They don’t know what they’re for, only what they’re against.” “Those hippie radicals” knew what they were for: concrete changes in political policies that would turn their dreams into reality. And they talked constantly about the dreams as well as the policies. It was Dr. King, above all, who inspired them. If, on that hot summer day in 1963, he had only denounced the evils of racism and proposed policy remedies, we would scarcely recall his speech half a century later. It holds a special place in our public memory only because he concluded by confessing his dream. Daring to be a public dreamer propelled him to greatness. Now, I fear, we mostly talk only about what we’re against. The just-give-‘em-the-facts approach, so tilted toward denunciation (however well deserved), scarcely leaves room for any other impression. There are still a few dreamers. You can find them among environmental activists, who give us science fiction-like descriptions of technology that can create a clean, sustainable environment for the whole biosphere. Except that isn’t simply a fantasy: much of the technology already exists. You can also find dreamers in religious communities, sharing the words of holy scriptures informed by eschatological visions of a better future. Occasionally, even a hard-boiled devotee of the facts like Noam Chomsky gives us a peek into his dream: a world without borders. Not long ago, you could find dreamers occupying parks and public spaces across the country, short-lived as their moment was mainly because of an onslaught of police violence. For that brief season, they showed us that our dreams had been occupied and needed to be freed. In the past, though, movements have persisted much longer, even in the face of massive state violence. 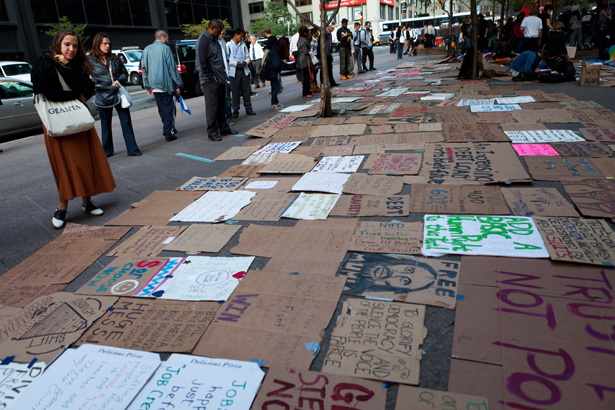 The Occupy movement, however, emerged in a distinctly twenty-first-century world in which activists have long become accustomed to hiding their dreams. Without such shared dreams, political activism can easily feel like nothing more than an endless struggle against insurmountable odds—like being part of a small band of good guys besieged on every side. Who can blame them for feeling overwhelmed, exhausted and hopeless? Once most Occupiers were forced to retreat from public spaces, I suspect they, too, felt tired, cramped, hemmed in. Occupy could flourish only in the open, where people could share their dreams and imagine that all the boundaries that limit us might, in that open-air spirit, dissolve. Boundaries and limitations dissolving: that’s not merely Chomsky’s dream, it’s the essence of all dreaming—to transcend the barriers that separate one person from another, one group or nation from another and all humanity from its natural environment. Dreaming is the realm of pure freedom. In dreams, we can see, do or be anything. When our dreams are political, they help us sense what it might be like to escape the limits imposed by corporations, the state, the media, the advertisers, powerful forces of every kind. They help us imagine in new ways what is possible. In our dreams, none of the powers that be can touch us. Freud said that every dream is the fulfillment of a wish, but political dreams aren’t about our private desires. They are visions of the public realm being freed from the artificial divisions and constraints of the present. There, as in our nighttime dreaming, we experience whole new worlds, constantly changing, often in remarkable detail. Dreaming is the realm of permanent revolution that the great political visionaries from Thomas Jefferson to Che Guevara spoke of. Constant change, pure freedom, the sense that anything is possible: combined, they can give us the daytime energy we need to work for change despite the obstacles and failures we inevitably face. When political life is infused with a dream, traveling without a map can feel exhilarating. In politics as in physiology, we must dream on a regular basis to restore our energy. But a political dream is quite different from the dreaming of sleep because it happens while we are wide-awake. It may even make us feel more awake, allowing us to pierce the pre-packaged version of reality handed to us by the rich and powerful, who demand that we take their distorted version of how this place, this country, this planet works as “realism” itself. When we see by the light of imagined futures, the present and its real possibilities come into clearer view, offering us a broader framework into which we can fit the chaotic pieces of current reality and the specific changes we are working for. We don’t have to wait for some distant future to see our dreams realized. The essence of the nonviolent action that Dr. King preached is to pierce the lies and distortions in the here and now by acting out, with our bodies, the authentic reality we have seen—to persist in what is really real (which is the best translation I know of Gandhi’s term satyagraha). So we should never let anyone dismiss our political dreams as “unrealistic.” The world as we wish it to be is no mere fantasy. It is often our most reliable guide to knowing the truth. Whether they know it or not, everyone has their own dream of the world as it should be, and every dream is open to endless interpretation. Dr. King had his. I’ve got my interpretation of his. I’ve got my own, too. And you’ve got yours. The point is not to argue about who has the one “correct” dream, but to bring all of our dreams out of the closet and voice them openly, share our interpretations of each other’s dreams and start a conversation about the politics of dreaming. When that kind of dream-sharing becomes part of political life, it begins to create myths. By “myth” I don’t mean a lie. I mean a story that a community tells itself to interpret its life, to express the fundamentals of its worldview and values, to give meaning and hope to events great and small. A myth, it is often said, is a collective dream. In myths, as in dreams, anything can happen. And once new myths start circulating, anything can indeed happen. There is a real chance that one myth (or several with much in common) will—by some mysterious, unpredictable process—grab hold of a big enough part of the body politic to stir it to action. The US saw that process at work in the 1770s (the dream of a republic), the 1860s (the dream of abolishing slavery) and the mid-1930s (the dream of basic economic security for all). In the late 1960s, the dream of radical democracy and equality for all took hold in millions of American minds. It happened surprisingly fast. In 1963, when Dr. King gave the nation permission to share our dreams, few could have imagined how radically the political and cultural landscape would be reshaped by new myths within just a few years. Of course, we should never confuse our dreams and myths with specific policy proposals. That would endanger the chances of achieving policies that could bring us a few steps closer to realizing those dreams. Policies, after all, are always political artifacts, produced by compromises between our dreams and the hard facts of the present. The coming commemoration of the “dream” speech should remind us of Dr. King’s recipe for meaningful political change: take one part facts to reveal the world’s evils, one part policy proposals to remove those evils, one part shrewd political strategy and one part dreams—shared aloud—and stir artfully into a political movement. Yes, it’s true, the world will never look exactly like our mythic dreams. But we can’t get to any better future unless we first imagine that future, together. A political dream is a magnet that pulls us toward our goals. It may also be an asymptote—a promised land that we can never reach. Yet even if we never get there, every dream takes us closer to a transformed reality. According to Rebecca Solnit, Edward Snowden’s actions were meant to take us closer to a “transformed reality.” Read her letter thanking him for his acts here. Ira ChernusIra Chernus is a professor of religious studies at the University of Colorado at Boulder and author of Apocalypse Management: Eisenhower and the Discourse of National Insecurity. Read more of his writing on Israel, Palestine and American Jews on his blog.